A Seattle man has published a coloring book attacking white men to soothe the soul of left-wingers, Democrats, and Black Lives Matter acolytes — just in time for Christmas. 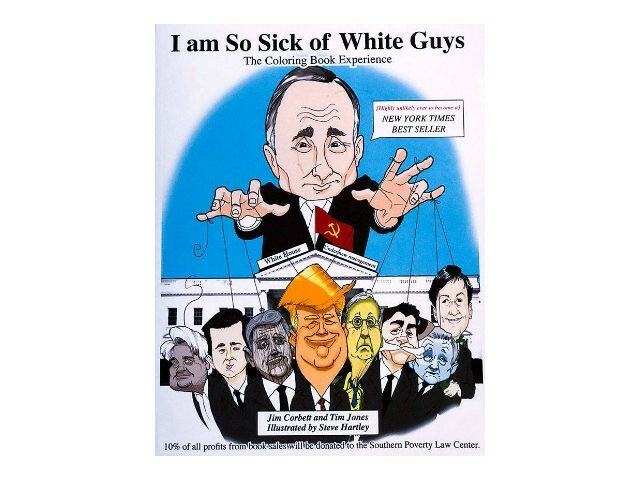 “I Am So Sick of White Guys,” the new coloring book by author Jim Corbett, is, among other things, aimed at attacking “white privilege” and accusing President Donald Trump of being a puppet for Russian strongman Vladimir Putin. Along with the Trump/Putin theme, Corbett included Ku Klux Klan rallies, attacks on white men for criticizing the NFL’s anti-American protests during the national anthem, and scenes celebrating the left’s attacks on free speech on college campuses. The idea came from Corbett’s habit of losing his cool over television news reporting on the evils of white people. Corbett — himself a white man — soon began dreaming up his coloring book as a way to relieve the stress in his put-upon liberal life. “It came completely out of me screaming at my TV, and the way the GOP is taking the country off in a totally different direction,” Corbett told the Journal News. Corbett and co-author Tim Jones –who is also white — then hired Steve Hartley — an African America — to draw the book’s pages, the result of which is now for sale at ten dollars a book on Amazon. Corbett also happily notes that ten percent of the profits are being donated to the left-wing Southern Poverty Law Center. The author said he has been dealing with “white privilege” for decades. He then told the paper that he knew “loudmouth” Bill O’Reilly back in college. “Nobody could empty a room quicker than him,” Corbett insisted. Corbett explained how white people have privilege. “Look, I’m a white guy; there’s a lot of white guys like me, and this idea of white privilege is a real thing,” he said adamantly. In fact, Corbett thinks he was a beneficiary of “white privilege” because when he was a young man, his parents once talked police out of arresting him. “I have been a beneficiary of white privilege and gotten in trouble for stupid things. If the same thing had happened to a couple of black kids it would have been different,” he said. Corbett also attacked the nation’s police and proclaimed ex-NFL player Colin Kaepernick an ideal citizen for the anti-American protests he invented during the playing of the national anthem. Finally, Corbett slammed Republicans for having closed minds and said he wants conservatives to buy his coloring book that ridicules and attacks them. “Be open to hearing other perspectives or opinion. And don’t be so defensive,” he said.